The TRUTH about using cheat days, refeeds, and spike days. 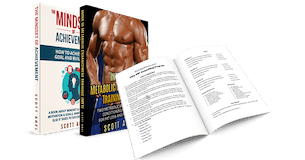 The Cycle Diet has been used for 30 years by Scott Abel with his clients to stay lean year-round while improving their physiques and their metabolism. The Cycle Diet is a strategy that uses regular cheat days, refeeds and spikes where “anything goes,” balanced against regular diet days of a relative caloric deficit. It is sustainable, customizable, insanely effective and FUN. Learn how to stay near peak condition all year long, while still optimizing metabolism and your physique! With the Cycle Diet, you do not just begin by adding cheat days to your diet like so many other “cheat day diets” out there these days. Instead, with the Cycle Diet, you’ll learn how to coax your body into “Supercompensation Mode.” Once your body is properly in Supercomp (how long this takes can be different for different people), you’ll be able to start weekly spikes where you eat whatever you want, and as much as you want. The book as info on how to get into Supercomp, how to tell for sure you’re in it, and how to start implementing the spikes. And yes, on the spikes… anything goes. Yes, this actually means you eat what you are craving, whether it is ice cream, peanut butter, pizza, lasagna, cookies, donuts, or whatever. Whether high carb or high fat, if you are craving it, you eat it. • Formulas and guidelines for determining how many calories to eat. • A variety of pre-made meal plans to use as “guidelines” for what to eat on diet days. • The science behind the diet, balanced against its real-world development in the trenches. • How to begin implementing calorie spikes, including the mid-week spike. • How the Cycle Diet has changed over the years. • What to expect as you’re getting into Supercomp Mode. • A practical, fun way to optimize your metabolism and improve your own metabolic resiliency. Learn about the diet that Scott’s clients LOVE. 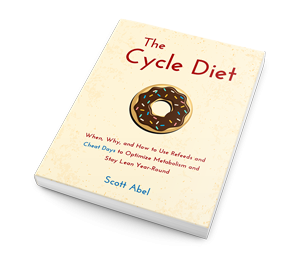 Get the new Cycle Diet book now!